Polaroid frames are a hot trend, and a great way to create focal points in your crafting projects. 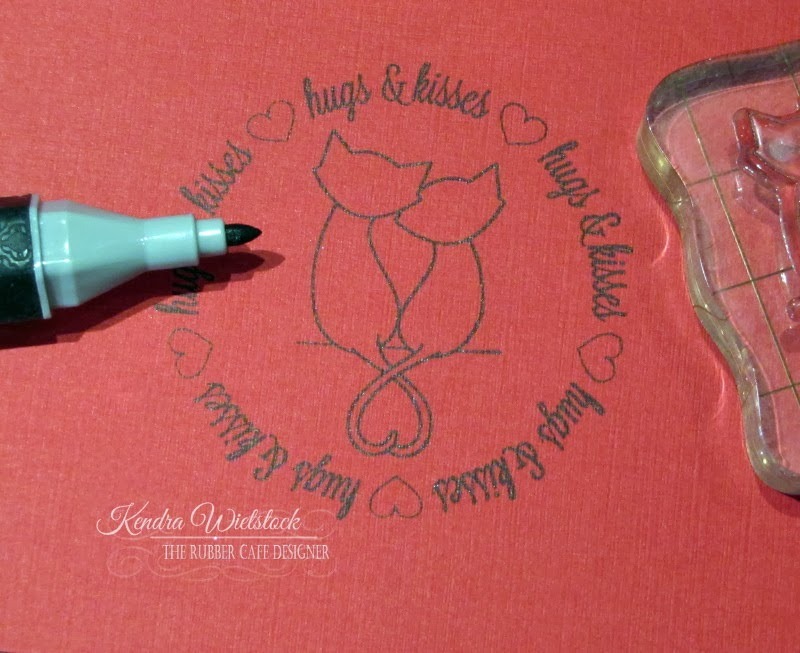 And it's handy to have a stamp or template, but they are also very simple to make on your own. 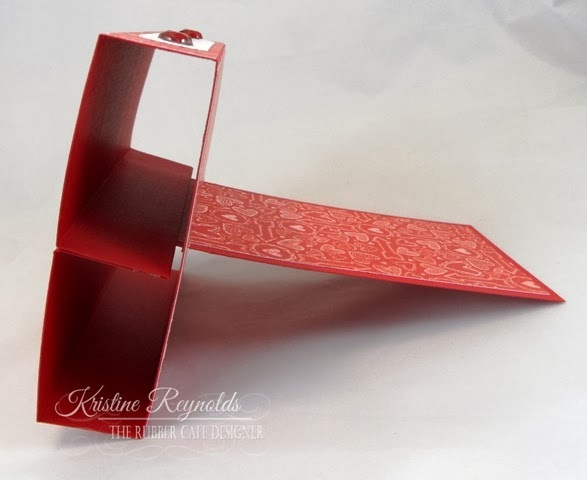 My card base is made with Kraft cardstock and cut and scored to measure- 5 1/2" by 4 1/4"
First layer is a 5 1/4" by 4" piece of red cardstock and adhered using Scrap Happy Glue. Use your paper trimmer or a craft knife to cut out the center leaving the "polaroid" piece. 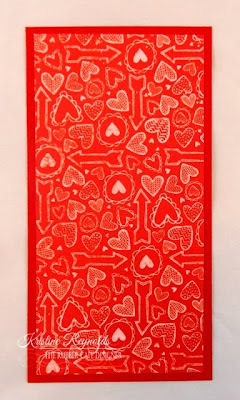 You can back the polaroid in a pattern you like (I used the hearts), then embellish. I used the heart clip with a piece of kraft cardstock behind it to make it "pop" and tied a few ribbons and twine onto the clip to create it as a focal point. 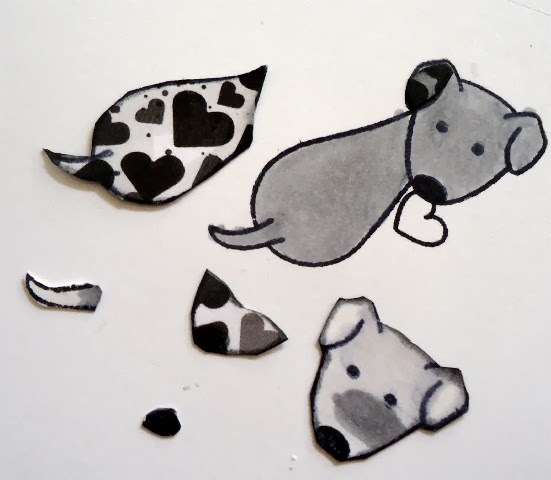 The puppy dog and heart bubbles are colored with Copic Markers, cut out, then attached using foam tape. 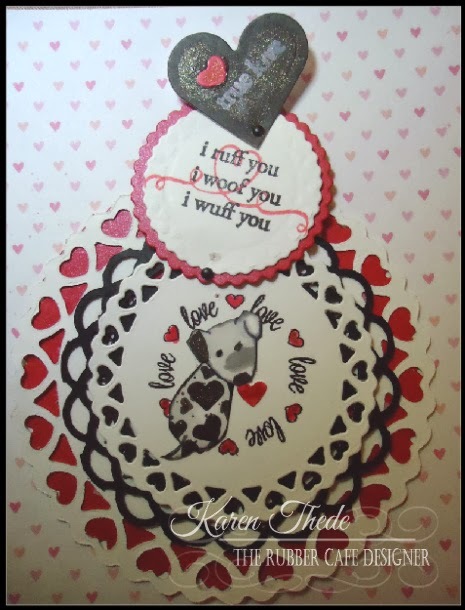 The Valentine sentiment is stamped in Black Tuxedo Memento and added to the top of the right polaroid. "You've Stolen My Heart" and the thin strip of heart paper with a rhinestone finish off the bottom of each polaroid piece. Ink: Memento Black Tuxedo; Copic Markers-R46, E35, E53. Hi All! 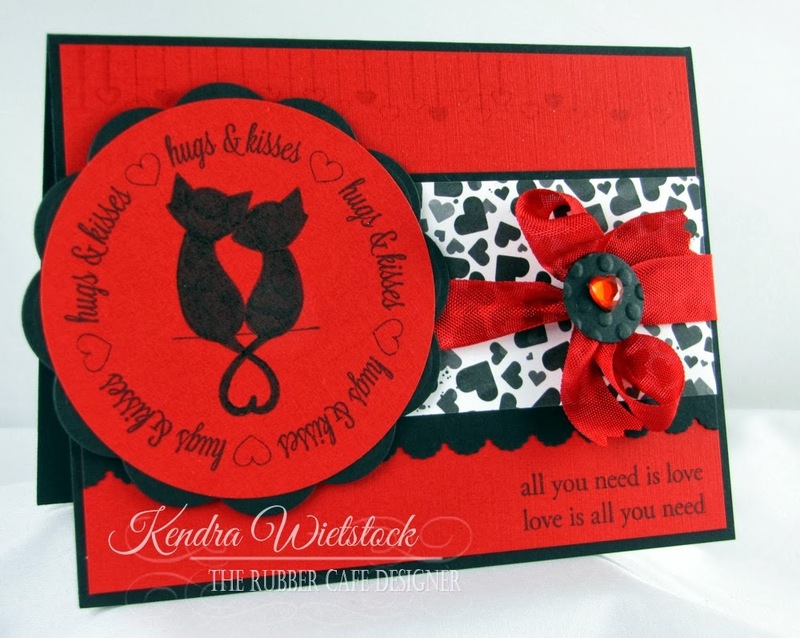 Kendra here today for The Rubber Cafe', this week I am once again spotlighting the latest Creative Cafe Kit called For the Love of Cats and Dogs with cute little kitty cat Valentine. 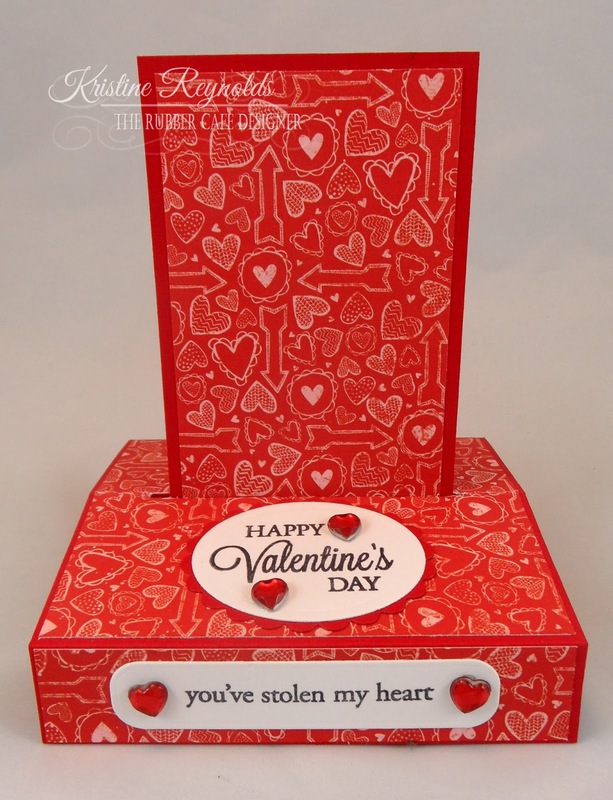 All of the stamped images, papers, cardstock, ribbons, and embellishments are included in this awesome kit! I just needed to add the ink, punches and a few die cuts. 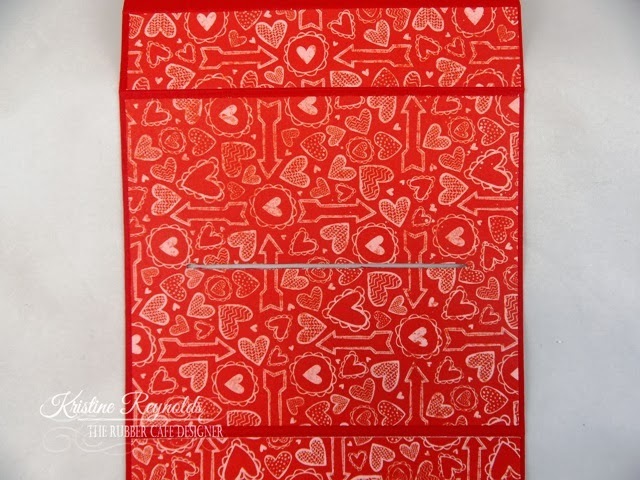 I added the hanging hearts border from the True Love Add-On stamp set using VersaMark ink. The reason I used VersaMark ink was because I wanted to fill the space but not detract from the rest of the card. Stamping it in black, or even red, would have been too busy. 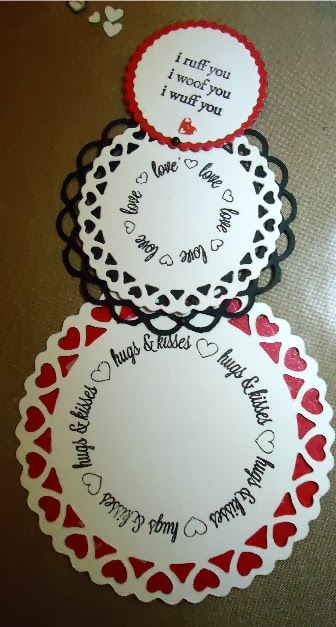 For the main image, I used the pretty Hugs & Kisses circle border from the True Love Add-On stamp set and the sentiment were both stamped in Tuxedo Black Memento Ink. Next I used the kitty cats from the You've Stolen My Heart stamp set that comes with the kit and I once again inked that up in Tuxedo Black Memento Ink. I wanted the kitty cats to appear as a silhouette, so I colored them in with a black marker. Look what a big difference that makes on the image! For a few final touches, I added the pretty Bo Bunny pattern paper, some red seam binding, and then a pretty red heart gem by Queen & Co. to the center of the bow. 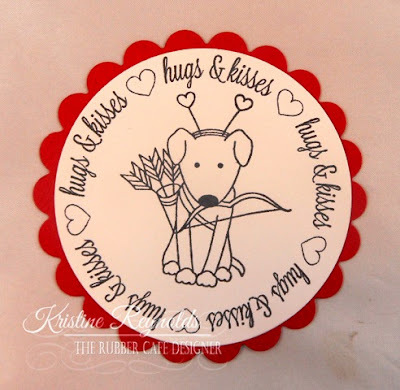 The Creative Cafe Kit is just filled with TONS of embellishments and papers to make your Valentine's Day projects AMAZING! 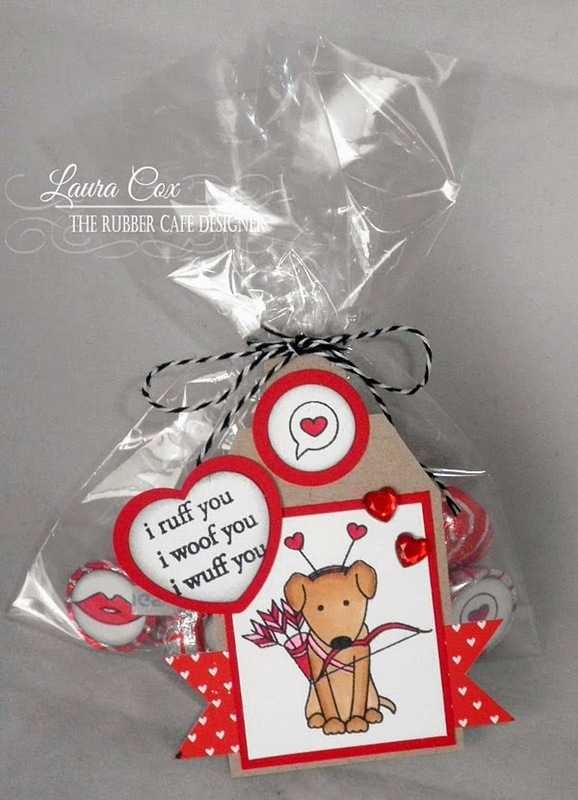 Check out more fabulous creations and inspiration from this Creative Cafe Kit on The Rubber Cafe Facebook Page. Hello! Happy Wednesday... Dawn Rene here to share a simple canvas that I made with the same collage stamped technique I used last week in my project. For this canvas I used the Butterfly Set, Paris Nights Background, Floral Silhouette, Don't Be Wishy Washi, and Faith Hope Love stamps! The inks are Tim Holtz distressed inks - Tea Stained, Wild Honey, and Forest Moss. Here is a brief tutorial on how I decorated the canvas. 1. On some white cardstock I stamped a couple background stamps with Tea Stained distressed inks. 2. Then I layered on some other stamps with Wild Honey and Forest Moss distressed inks. Some of the impressions were second generation to make them lighter. 3. I cut out 12 - one inch squares from the stamped paper. Then I inked the edges with the distressed inks. 4. I cut out a piece of cardstock ~5" x 7" and distressed the edges. I glued the squares to the cardstock with Scrap Happy Glue creating a grid. 5. I layered the collage stamped grid on top of a piece of moss colored suede, distressed the edges of the canvas, and decorated the rest of the canvas with metal embellishments. Here is the finished canvas again! Hi There! 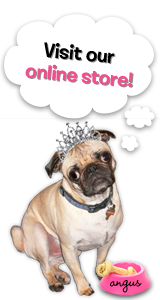 Welcome to The Rubber Cafe' blog! Today I have a fun "Pop Up Card" to share with you that I made with the January For the Love of Cats and Dogs Creative Cafe' Kit. 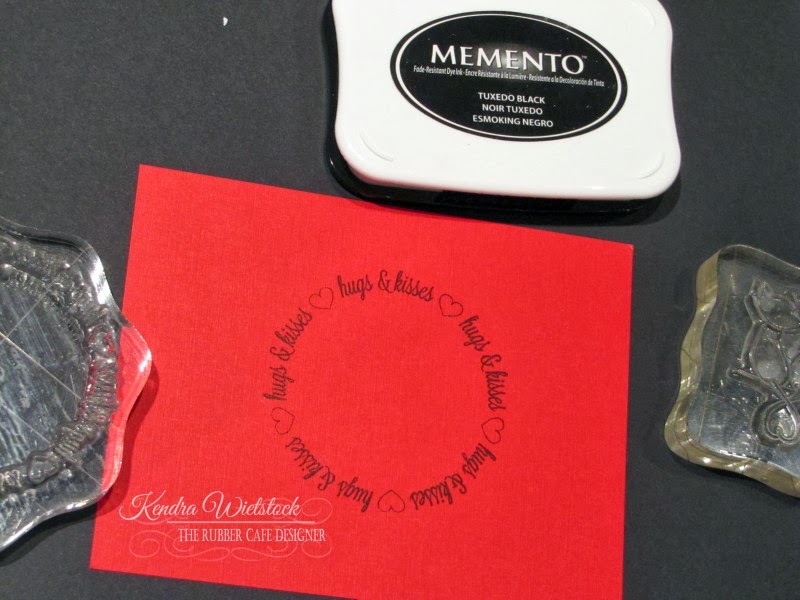 In addition to the For the Love of Cats and Dogs Creative Cafe' Kit, I used Scrap Happy Glue, memento ink, copic markers, Score Tape, and Spellbinder dies. Here is a look at the completed Pop Up Card. Keep scrolling down for step by step instructions to create one on your own. 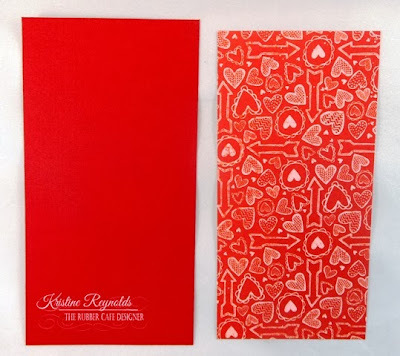 Start by cutting one of the pieces of red cardstock in half to create a 11" x 4 1/4" panel. Score the panel at 1", 2-3/4", 3-3/4", 5-1/2", 7-1/4", 8-1/4", and 10". 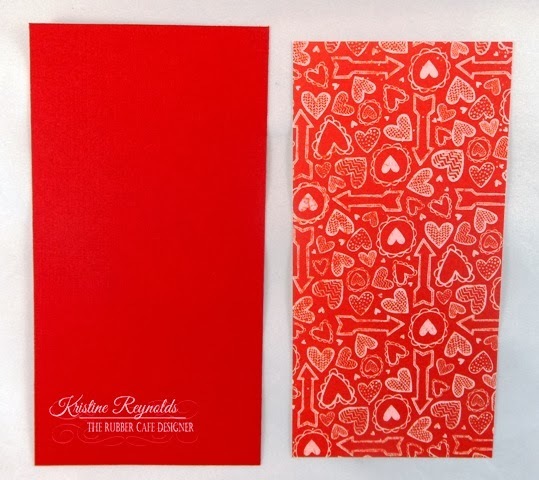 Cut 2 pieces of patterned paper 4 1/8" x 7/8" and cut 1 piece that is 3 3/8" x 4 1/8". 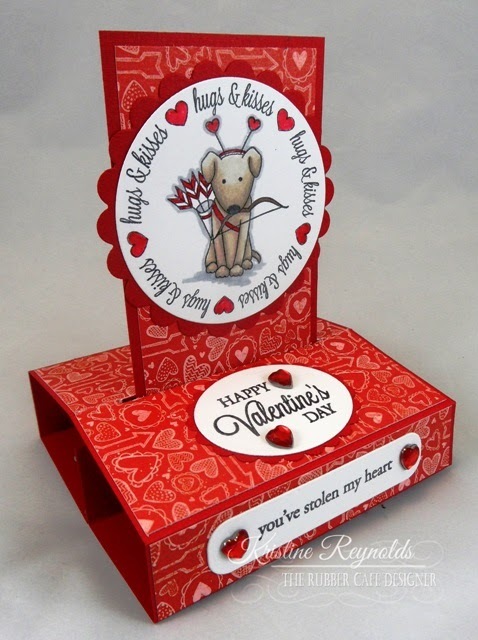 Use Scrap Happy Glue to adhere these three panels to the red card base as shown in the picture below. Cut a thin slit in the center of the middle panel starting and stopping 3/4" from the edge. 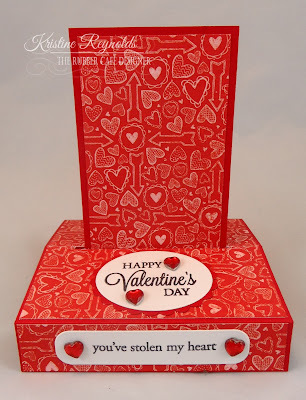 Stamp sentiment with black ink on a white die cut label or thin white strip of cardstock and adhere to the lower panel with Scrap Happy Glue. Adhere a heart to each end of the sentiment strip. 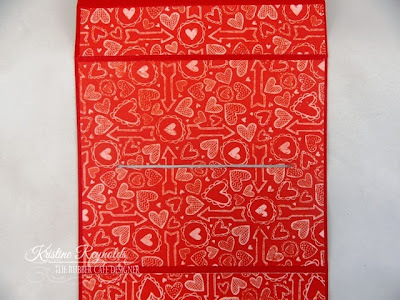 Adhere the patterned paper panel to the red panel with Scrap Happy Glue. 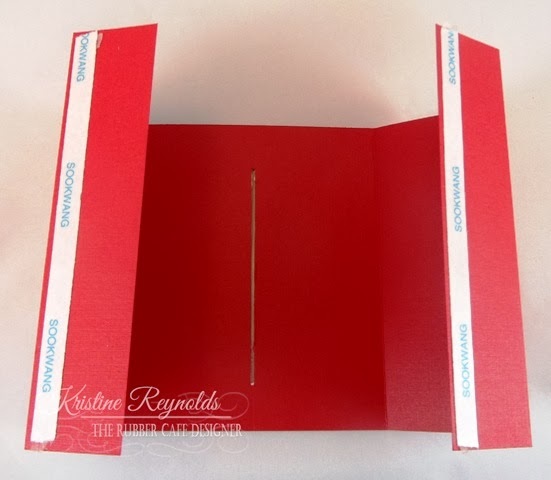 Apply a strip of Score Tape to each end of the card base as shown in the picture below. 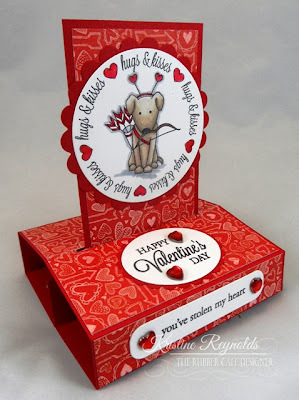 Slide the smaller panel through the slot of the card base and adhere it together as show. HINT: Experiment with this step before pulling off the Score Tape to make sure you understand it and that you are putting everything together correctly. This is how the card should look when properly assembled. 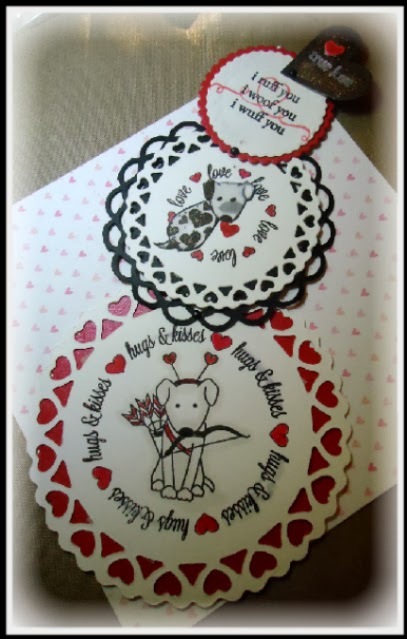 Create the second sentiment panel by stamping "Happy Valentine's Day" with black ink on a white die cut oval panel. Back it with a red scallop edge die cut oval panel. Adhere to the top of the base with Scrap Happy Glue. For the main panel stamp the images on a white panel with black ink. Die cut panel into a circle that fits around the circle sentiment. Back with a red die cut scallop circle. 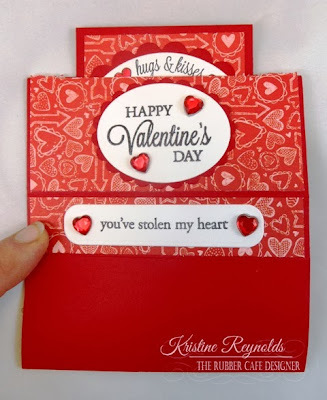 Color the image with Markers and then adhere to the card with Scrap Happy Glue as shown! You should be able to slide the entire Pop Up card down flat so it will fit into an envelope. That's it! 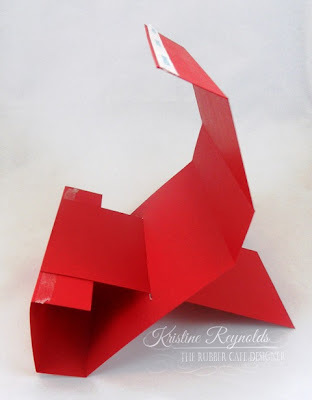 I hope you you enjoyed today's "Pop Up Card" tutorial and that you will give it a try! 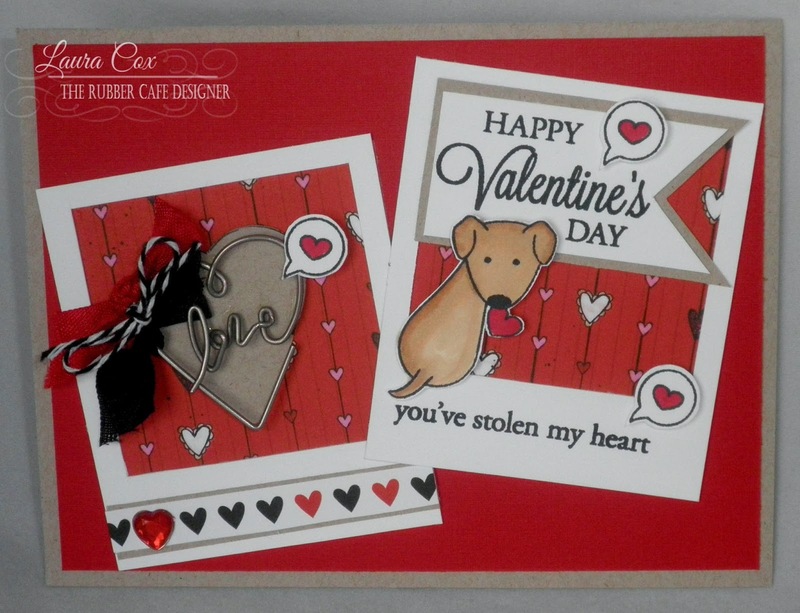 Stamps: The Rubber Cafe' - Creative Cafe' Kit - For the Love of Cats and Dogs, add on set "True Love"
Hi - It's the weekend, and today I have a fun card I believe is called the 'Telescoping' card. The circle elements from the Add-on stampset really leant itself well to this card design. And I also am featuring the darling 'pups' from the set For the Love of Cats and Dogs - which comes with your kit. Here's my card... fully extended. It's so easy to do - just prepare your layers, and join with brads so you can fully extend this card with ease! 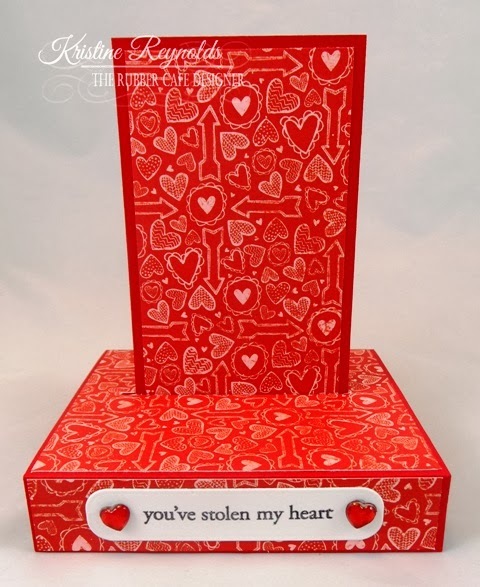 First to create this - I started with the heart borders nesting set, from Spellbinders. I did this in white as I plan to stamp my circular phrase images on each one in black in. Below, you can see how I'm setting up each stamp and lining it up to stamp - these just fit perfectly! 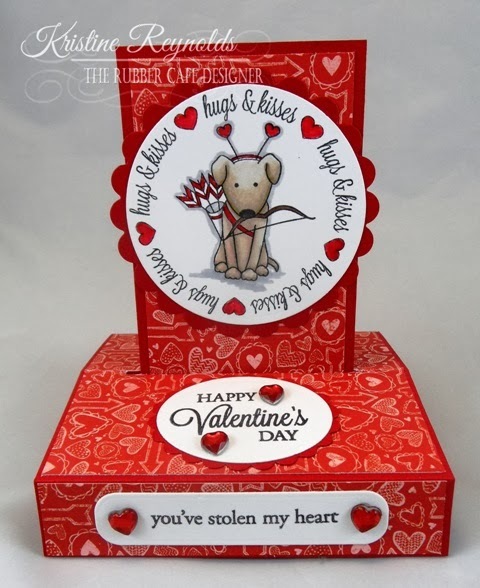 I paper pieced and stamped my sweet 'pup' image holding the valentine! I assembled him - and he will eventually end up in my center circle. As you stack your images from small to large- just make sure that you have your images upside down as you place your brads, so they will unfold in the upright position. See in my images below- my top image is placed in the center with the phrase upside-down, and the brad will be placed as close to the upper center edge of the top circle that I can. When swiveled open, you can see the text will be upright and the brad anchored edge is on the lower bottom edge of the top circle connected to the top center edge of the circle layered underneath. On images where they are symetrical as in my middle and large circle, it didn't matter, so to make it easy on myself, I placed my pieced pup on the center after I had my pieces joined by my brads. Here are all my pieces joined - just need to finish by adding more stamped images on each circle. Here's it all joined and collapsed and ready to be slipped in an envelope and mailed to a lucky valentine! You can see I added a 4th layer with a black heart, and stamped in white- 'True Love'. A small black brad in the lower point of the heart is connected to the circle directly behind it. Here's my card again, as it's fully extended - all my other images were stamped directly to the circles. 1. Cut 3" by 2" piece of kraft cardstock, trim off 2 corners (the 2" length side). 4. 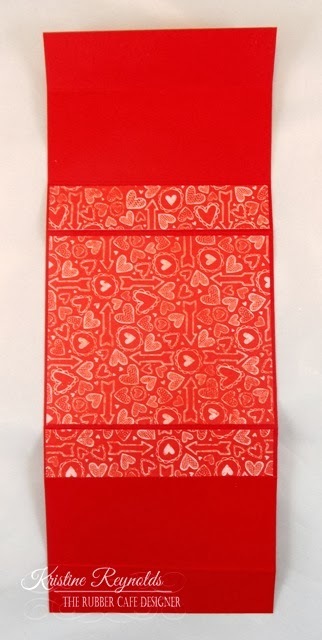 Cut 1" by 3" strip of heart paper and cut "V" shape in each end to make banner. 5. Adhere banner to tag, then matted puppy dog piece using Scrap Happy Glue. 6. Cut 3/4" by 2" strip of kraft cardstock to make top tab for the tag. Fold in half, adhere bottom with thin line of Scrap Happy Glue, and adhere to back of tag. 7. 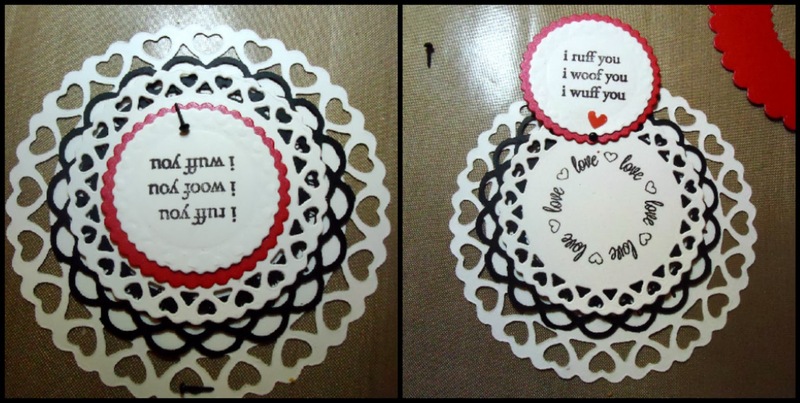 Stamp, color and punch out "heart bubble" stamp (using 3/4" circle punch), and "i ruff you, i woof you, i wuff you" sentiment (using 1&1/4" heart punch). 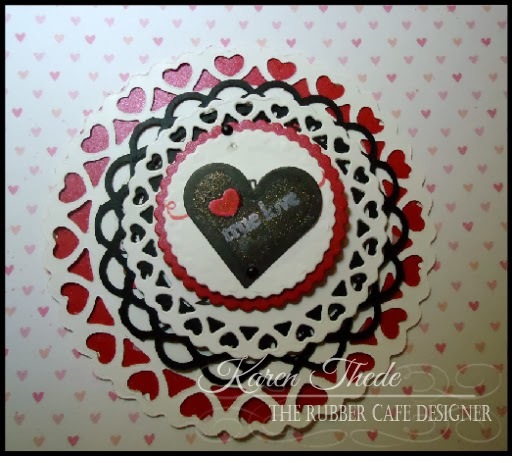 Mat using 1/4" larger punch (1" circle and 1&1/2" heart) with red cardstock. I also used a little Black Soot Distress Ink around the edges, then glued both pieces to the tag. I added two of the heart shaped Queen & Co. rhinestones, and used the Queen & Co. twine to string the tag on the bag. 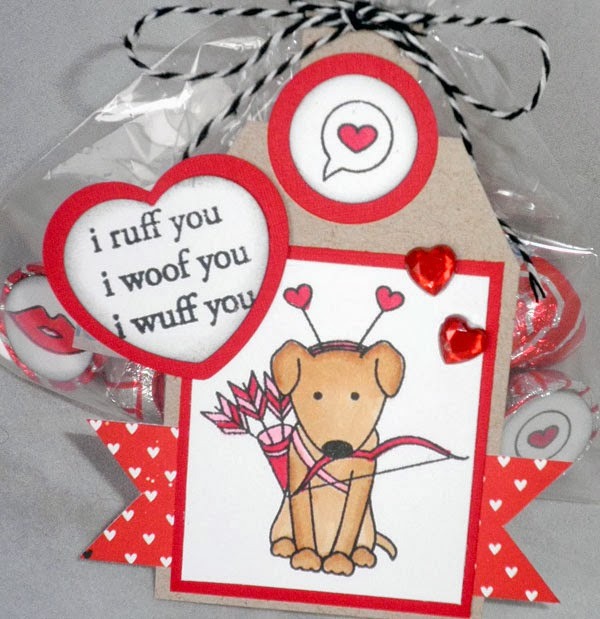 Thanks for stoppin' by the cafe' today....hope you are inspired to treat someone this Valentine's Day!